Riding loose dirt on a bike is similar to skiing powder. The width of the tire or ski can be as important as its design. 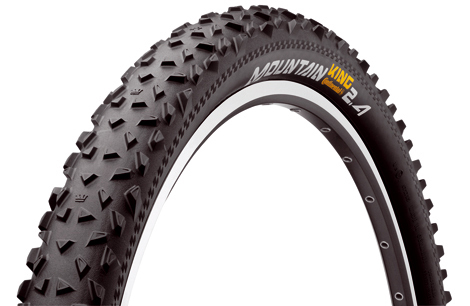 For the majority of last summer, my mountain bike tire of choice was the 29-inch Continental Mountain King 2.4. Before I get into the review, a little bit about my hometown trails in Mammoth Lakes, California. Although they are covered with snow much of the year (more than 550 inches of it this year!) when mountain bike season begins there’s close to no precipitation. You can ride for weeks without seeing water on the trail, and this being a volcanic area there are also areas where the pumice is deep. Ride a narrow tire and you’re often sinking into the dry stuff. Add some width, and unfortunately, a little more weight, and you stay on top of it. That said, I didn’t notice the additional rotating mass with the Continental Mountain King 2.4. In the dirt and pumice, these tires performed admirably, holding a line and providing plenty of traction in corners and while climbing. During early season, when I hit wet patches at higher elevations from snow run off, they gobbled up whatever mud I came across. For racers or those who ride less-dry conditions, the Mountain King is also available in 2.2-inch width for 29er bikes. 26-inch bike tire versions are available in 2.0-, 2.2- and 2.4-inch widths. After riding five days a week for a couple months, I never, ever had a flat — even when running low pressure. You may call that luck, but I call these tires sound. They are a great deal, too, at $40 a pop.